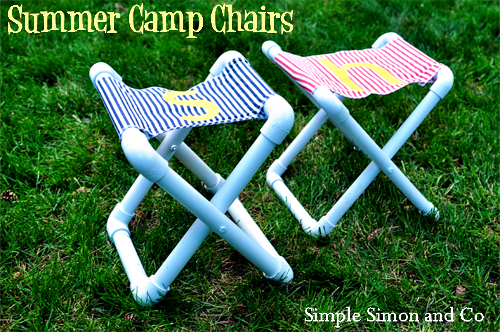 A camp stool is a folding chair that folds flat, and can be stored in a stack, in a row, or on a cart. This is a perfect piece for travelling or just for outdoor spaces because it can be folded and hidden anytime. Such a chair is a must for many terraces, gardens and outdoor spaces and for kids’ parties, too, of course. You may find such chairs of various materials and in various configurations but why buying when you can just DIY this simple piece? Here are some tutorials that may help you, I’ve divided them into tripod and usual ones, choose what you like. The first tutorial here is a tripod camp chair done with waterproof canvas, for it to survive in rain or shine. 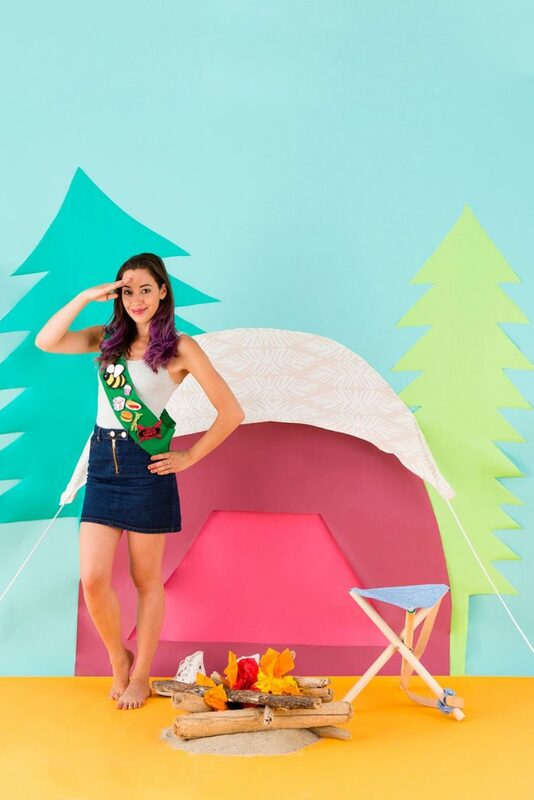 This camping stool is the perfect height for marshmallow roasting though you may vary the height and the size plus choose the fabric in any color and pattern that you like. Go bright and have a bright summer taking this chair to the beach, hiking and any other place where you are going! 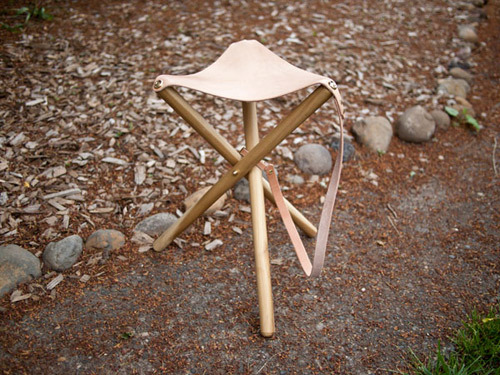 This is an old-fashioned camp stool right for those who don’t like modern stools. It’s built of birch and blush leather and can hold a grown up person easily. With the help of some hefty dowels, a little hardware and a piece of leather or heavy canvas, you’ll be sitting by the campfire in style. If you are thinking of some cool DIY gift for a man, I have an idea for you! 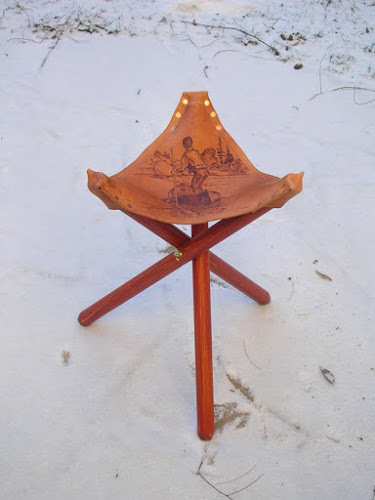 This foldable leather fishing stool whips up pretty darn fast and is super easy to make. It’s an amazing idea for those who love adventures, hiking, fishing, beaching and much more. The resulting chair is a stylish piece of wood and leather and suede in black with a stylish seam in the center. Wow! 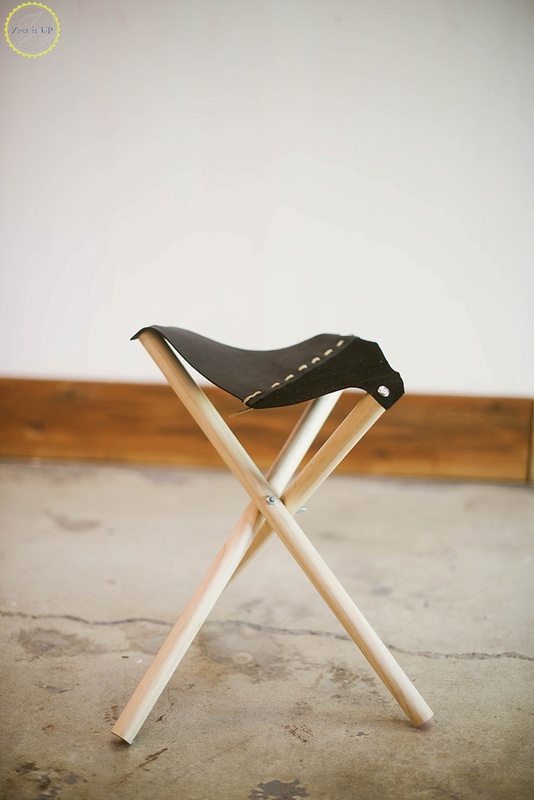 This chic tripod folding stool is a great craft for anyone and it features a very bold leather seat. The author ended up decorating by burning a canoe related theme to the seat and if you wanna know how to apply such images to your stool, too, read the tutorial to find it out. Get inspired to make an original item for your adventures! 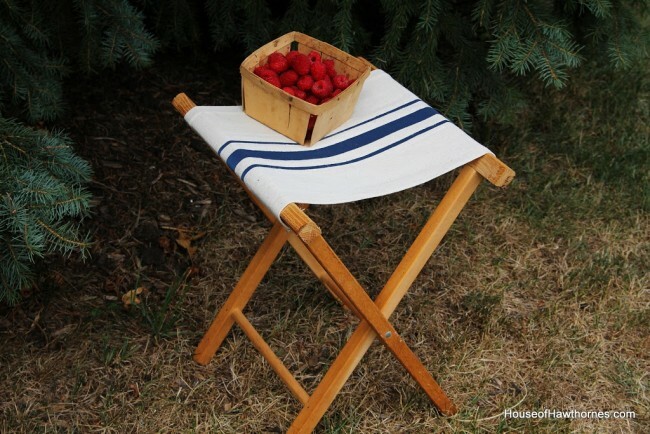 Such a shape of a folding stool can be more comfortable for sitting though it takes a bit more space. 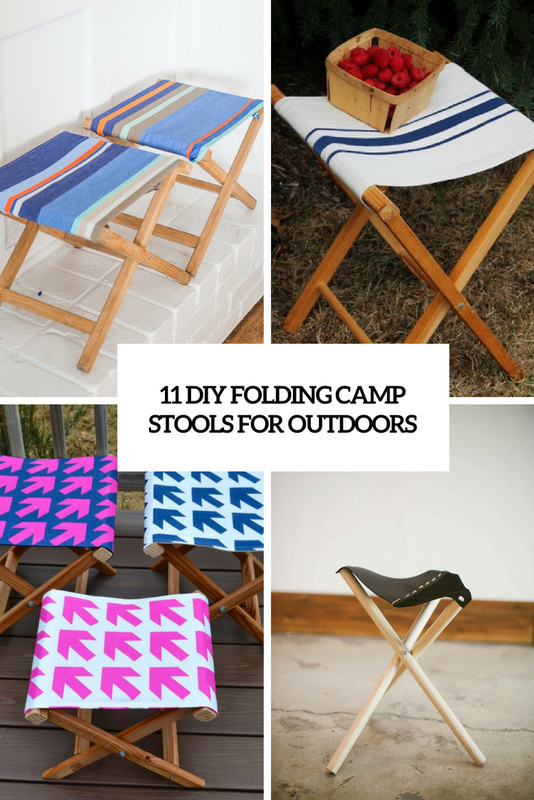 this DIY folding stool is made from scratch! Though they are meant for kids, they can easily be sized up for adults, too. There are also dimensions in this tutorial for a larger stool, use colorful fabric for the seat to make the stools brighter and more cheerful. What do you do when you have an ugly non-vintage camp stool in your vintage loving life? Make a vintage-inspired one with a cool look, of course! This whole project took about 15 minutes and the hardest part was putting the tape down evenly. The fabric was hand painted but you may use some ready fabric to make the seat more long-lasting. Enjoy! This project is simpler than some previous because it features a ready stool and is only about changing the seat of the stool. The tutorial includes instructions on stamping a usual piece of fabric to fit your space, though you may skip it if you have proper textile. 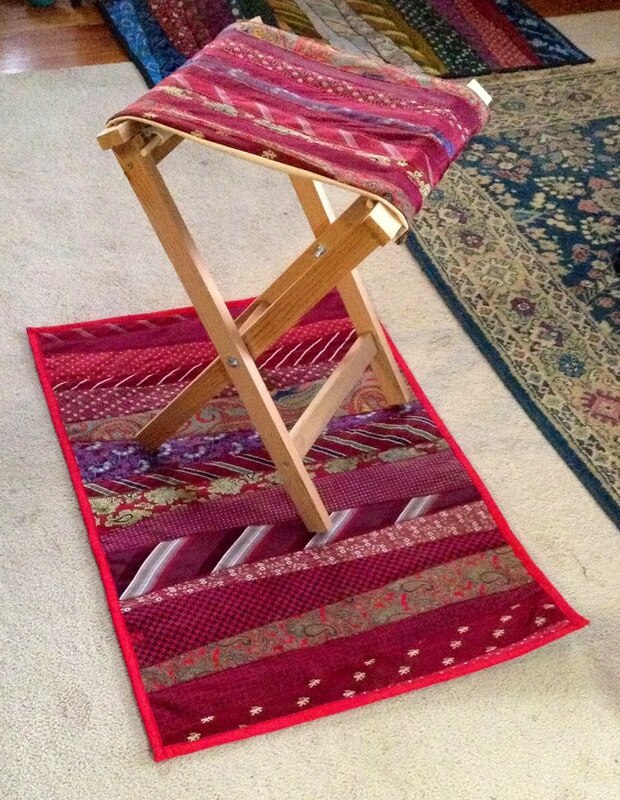 Read how to change the fabric on the seat and go crafting! 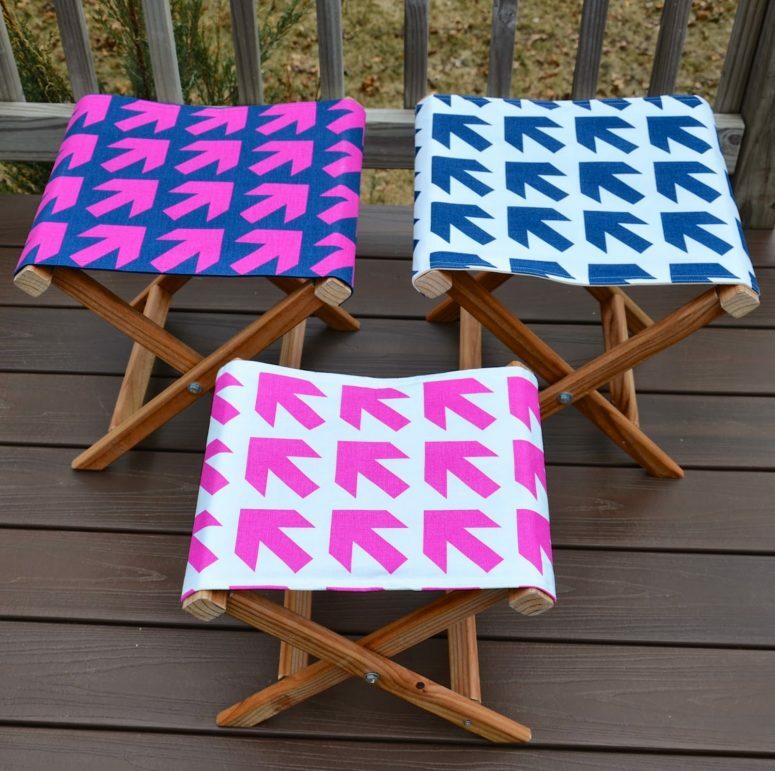 Upcycle some usual vintage camp stools with paint and new seats! The tutorial will tell you how to dip the legs into paint to make them bolder and brighter and to change the existing seats for leather. Leather is more durable and can hold more weight than usual fabric. The final result is very elegant and bright, ideal for a colorful touch in your interior. 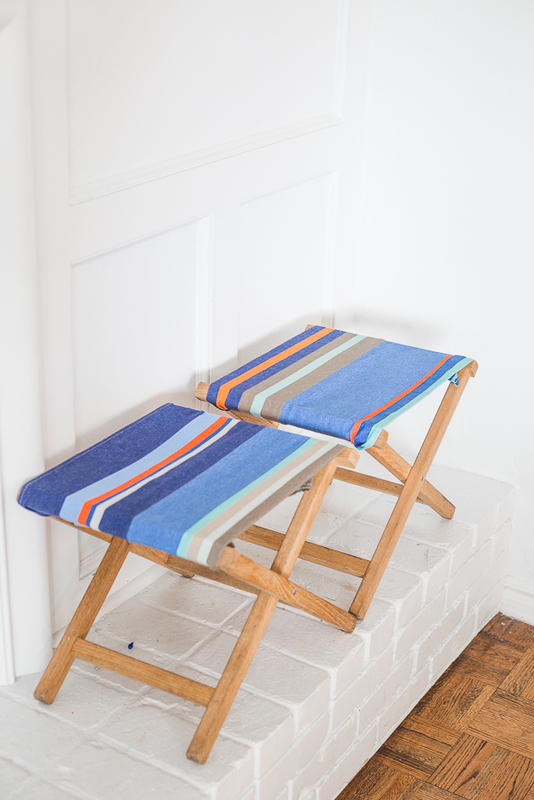 Here’s a project for a bright beach-inspired interior – these folding stools are renovated with bright striped fabric in blue and coral. The stools themselves aren’t very large, the author removed the existing fabric and stapled new textile to them. read how to do that all without fuss and spruce up your interior and outdoor zones with bright chairs! 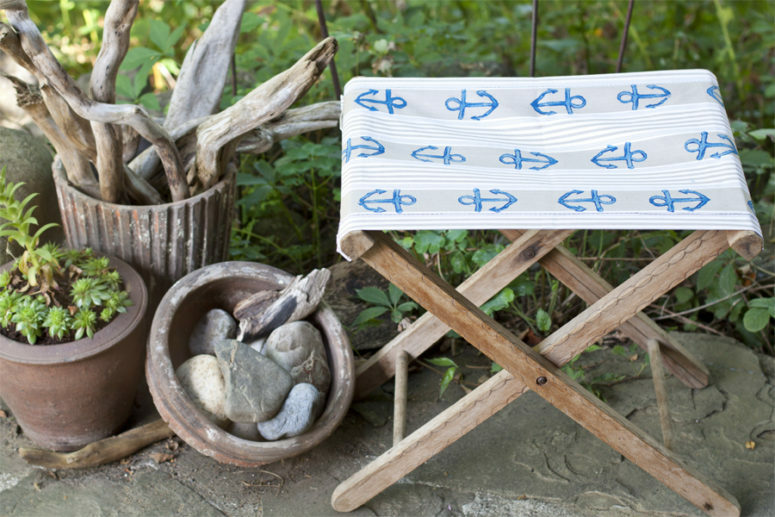 This folding camp stool is made of a very unusual fabric if it may be called so – these are neck ties! The author zigzag stitched vintage neckties to plain canvas and then constructed the stool frame. The result is a vintage boho piece, which will fit both indoors and outdoors and will bring that folk boho feeling to it. 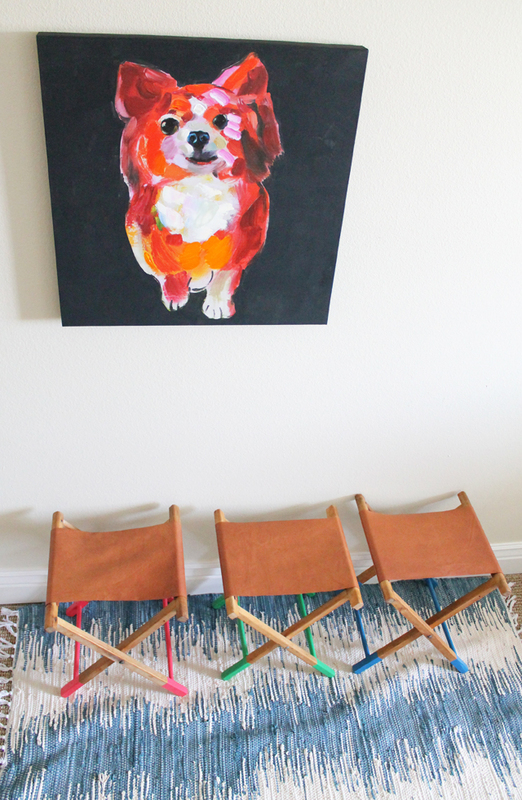 Get inspired to upcycle your old neck ties into a cool furniture piece! These stools are more durable than all the previous ones because they are made of pipes. Make some cute and stylish industrial-inspired stools like these ones and add fabric that matches – here it’s bright and printed but you may go for something neutral to match the industrial style. Or just paint the pipes to make them bold, too. Such stools will be indispensable for any kinds of kids’ parties.